We shared a moment. Me and Sandra Bullock. It was Mardi Gras in New Orleans and good cheer was in the air. So too was a set of small green beads she’d flung randomly into the crowd from her float as that year’s Celebrity Monarch for the Krewe of Orpheus parade. I reached out my arm and caught one end as the other hit me in the forehead. A bonding experience extraordinaire. Pre or post Miss Congeniality? How old is Mardi Gras? Old. Not horseshoe old. More like after Christianity began old. The celebrations provided some merrymaking before the penitence during Lent. “Fat Tuesday”, cause you’re definitely not getting slimmer after all the eats and drinks. 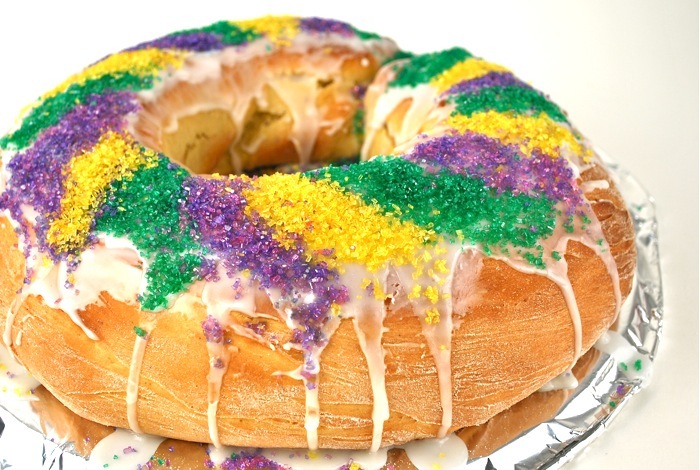 Speaking of eats, what’s a king cake? Is it true they hide things in the cakes? Yes. Find the trinket inside and you get perks. Was Sandy Bullock the best Celebrity Monarch of all time? Yes. Although the cast of Reno 911 (in 2009) is a close second.